Bertin Bioreagent offers primary and secondary antibodies for laboratories. As essential tools, they are particularly versatile when properly validated. Bertin Bioreagent offers a broad range of primary and secondary antibodies that have been tested by Bertin scientific team or partner labs in current applications such as WB, IHC or RIA. Thanks to its expertise in assay kits development, Bertin Bioreagent provides a comprehensive offer of CGRP antibodies, histone antibodies and transcription factor antibodies. Bertin’s prion protein antibody range is widely used by neurodegenerative disease research labs. Bertin Bioreagent can also provide dedicated antibodies licensed to partners. Inflammation and pain are ubiquitious answers of an organism to an injury. Acute as well as chronic inflammation are challenges for pharmaceutical labs. Neurodegenerative diseases are among public health main concerns as they are becoming increasingly prevalent. They are well known and widespread, like Alzheimer disease, Parkinson disease or Prion linked diseases. Reactive Oxygen Species (ROS) are either produced during respiration as side product of oxygen consumption, or by lymphocytes as first level of host defense. Most laboratories are familiar with ELISA kits, but developing a kit takes time. 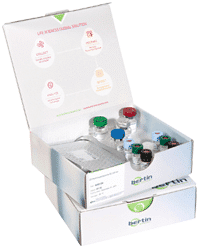 Bertin Bioreagent provides ready to use and validated assay kits, for more than 30 years. While it is mandatory in clinical application, many kits in research do not evaluate in depth the pre-analytical phase (mainly because it’s highly variable). Bertin Bioreagent has a different approach.